Freeman, Milton M.r.. "Arctic Indigenous Peoples in Canada". The Canadian Encyclopedia, 16 October 2018, Historica Canada. 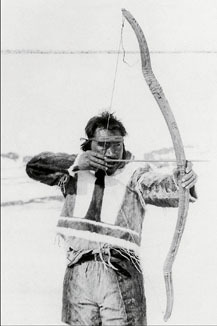 https://www.thecanadianencyclopedia.ca/en/article/aboriginal-people-arctic. Accessed 19 April 2019. Community on the north coast of Baffin Island in Nunavut. Who are Arctic Indigenous Peoples? 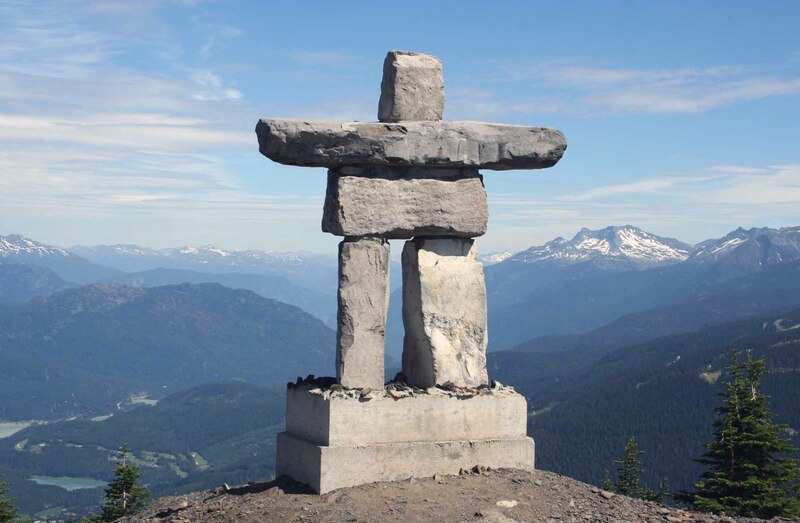 Indigenous peoples in Canada, both historical and contemporary, have inhabited six cultural areas that, unlike provinces and territories, do not have strict boundaries, and instead refer to areas in more general terms. The Arctic is one of these cultural areas. The others include the Plains, Plateau, Subarctic, Northwest Coast and Eastern Woodlands. Referred to as Inuit Nunangat, the Inuit homeland comprises those inland and coastal areas north of the treeline. It is for this reason that the terms Inuit — itself a generic term — and Arctic peoples are often used interchangeably. A tenth group, the Sallirmiut (Sadlermiut), are no longer in existence. 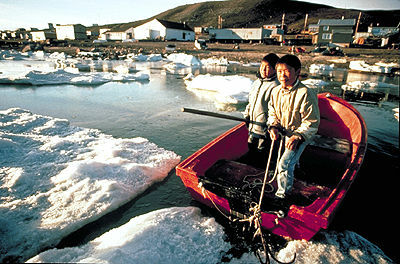 In 2011, there were nearly 60,000 Inuit in Canada, 73 per cent of whom lived in Inuit Nunangat. The Inuit are not the only northern Indigenous peoples in Canada. In areas close to the treeline, Indigenous peoples, including some Innu, Dene and Cree nations, have traditionally occupied similar environments to the Inuit (though rarely at the same time), and have hunted and fished similar game species. These northern Indigenous peoples have lived in parts of the Yukon, Northwest Territories, Nunavut, Québec and Labrador. These arctic regions are characterized by long daylight hours in summer with moderate temperatures. Winters are long and cold, and at more northerly locations there is a mid-winter period when the sun is entirely absent. Plant cover may be continuous, especially in well-watered locations, although rocky outcrops and barren dry areas are common. Trees are entirely lacking in the Arctic, though low shrubby plants occur, including several varieties of edible berries. Landforms are variable, from lake-studded lowlands to glacier-strewn alpine areas. 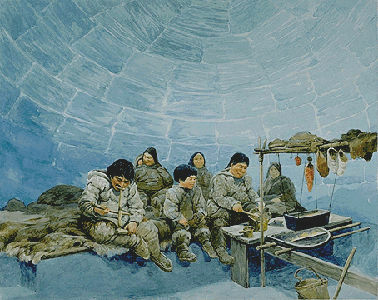 Inuit family inside an igloo. The man on the left is using a bow-drill, used to drill holes and to start fires. Historically, Inuit communities contained 100 –1,000 members. These regional bands were the most important social and political unit. Band members often congregated for short periods during the winter months, when people gathered in sealing or hunting camps. 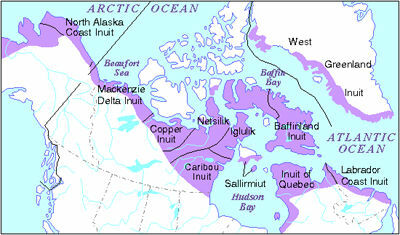 Several regional bands made up the larger Inuit groups. Marriages occurred within these larger groups and all members spoke a similar dialect. During the rest of the year, Inuit lived in smaller bands, often composed of two to five families. Each household generally consisted of a married couple and their children, though elderly or unmarried relatives might also be present. Many economic and social activities involved inter-household co-operation, and widespread sharing was, and still is, a fundamental characteristic of Inuit social life. Most families who chose to live together were closely related, with leadership of the group generally assumed by the family heads. In some groups, the isumataaq, an informal leader who was often a young man with proven hunting and leadership skills, also held authority on social matters, such as adoption and marriage. Marriage was nearly universal among Inuit and customarily took place in early adulthood; it was common for the young couple to reside close to the parents of one or the other spouse. Many households included adopted children, an indication of the high value accorded to children. Children were an important means of establishing valued inter-family relationships through adoption, engagements, adult-child relationships established at birthing ceremonies, and naming practices. The family was an important economic unit, relying on a decided division of responsibilities among all household members, including children and elderly relatives. Inuit society associated birth with several socially significant rituals. Among some groups, in addition to an attending midwife, there was another adult who served as the child’s ritual sponsor, assuming responsibilities for the child’s moral upbringing. Throughout life, special terms of address were used. For example, according to a Netsilingmiut elder interviewed in 1991 for Betty Issenman’s Sinews of Survival (1997), a godfather calls his goddaughter arnaliaq, which means “making you a woman,” while she calls him sanajiarjuk, “dear little maker.” Naming occurred at birth and had special significance, as Inuit names included part of the identity and character of the name bearer. The arrangement of children’s future marriages could occur at any time, even before birth. Young people promised to each other used a special form of address, and their families related in ways appropriate to the future relationship. Marriage, an exceptionally stable institution among Inuit, was customarily preceded by a period of trial marriage. Polygyny, having multiple wives, and more rarely polyandry, having multiple husbands, also occurred, but were not common practices. Inuk man in front of a topek (summer house) and kayak, Peel River, NT, 1901. 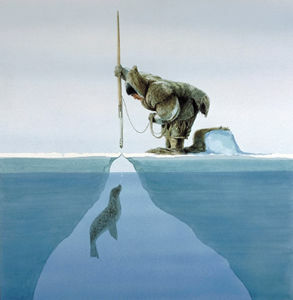 In the traditional waiting method of the Inuit, the hunter waits patiently at the breathing hole for the seal to appear. 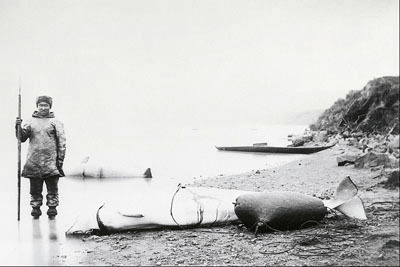 Inuk hunter with harpoon and white porpoises, Little Whale River, Québec, 1865. 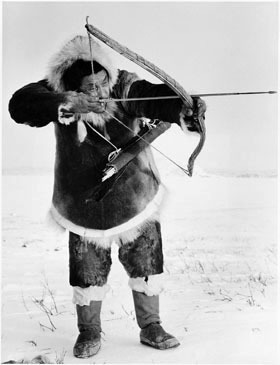 Inuk man hunting with a bow, Coppermine District, NT, 1949. Most Inuit groups based their economy on sea-mammal hunting, particularly seals. In summer and fall, many groups hunted caribou or moved to favoured coastal locations to hunt and fish a variety of game species. Fishing and food gathering (for bird eggs, shellfish and berries) were important seasonal activities, as were hunts for polar bear and whale. Though high value was placed on fresh food, people also preserved and stored goods for future use. Drying and caching in cool areas were common techniques, although several special techniques (such as storing in oil) were also used. Traditional technology was based on locally available materials, principally bone, horn, antler, ivory, stone and animal skins. In some areas people used grass or baleen (the material used by whales to strain krill and plankton) for basketry and other containers. They also substituted wood or copper for antler or bone, and bird or possibly fish skins for animal skins. Many Inuit inventions are considered technological masterpieces for their resourcefulness and strength of design, like the igloo, the toggling harpoon head and the kayak. There was an important relationship between location of settlements and seasonably available food resources. 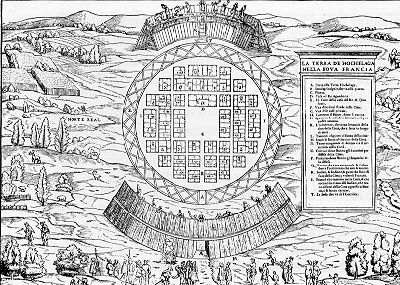 The composition of settlements might change periodically in response to social needs and desires to interact with kinsmen residing elsewhere. Many hunting methods became more effective when several hunters worked co-operatively, such as during winter seal hunting. Some Inuit only used the igloo when travelling but others relied on it for housing through the entire winter. The kayak is a narrow hunting boat made of sealskin stretched over a wood or bone frame. 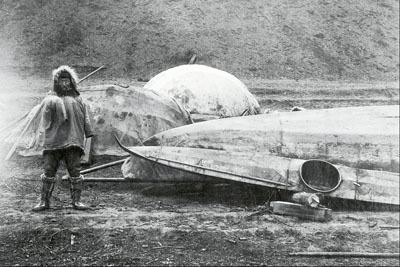 The larger umiak was used for transporting goods and people. The runners of the sled, or komatik, were iced with spit to reduce friction. All Inuit used sleds and skin-covered boats, though regional variations in both design and use were common. Dogs historically served as hunting animals, locating seal breathing holes in the sea ice, hunting muskoxen, holding bears at bay and serving as pack animals in the summer. Men used single-seat kayaks for hunting sea mammals, and for hunting caribou in rivers and lakes. 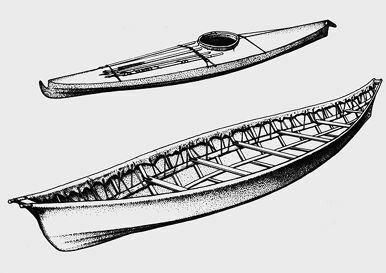 In the Beaufort Sea and along the Alaskan coast, large skin-covered umiaks were used for whale hunting, although in the Canadian Arctic (and Greenland) women more often used such boats to transport households from place to place. The skin tent, often with a short ridgepole, was generally made from sealskins and weighted down along the ground with rocks. Among the Kivallirmiut, the tent was often conical shaped and constructed from caribou skins. When suitable snow was not available for igloos, or when away from the sites of sod and stonewalled houses, tents served as temporary shelters. Igloo design varied. At winter settlements, the main living chamber could be quite large, perhaps four metres in diameter and almost three metres in height. In addition, igloos featured chambers for storage and an entrance passage, and often, extra living chambers attached to the side. In some regions it was customary to line the walls with caribou skins for insulation. Most igloos had a snow sleeping platform and a window (made from clear lake ice) set into the roof. Smaller, less elaborate igloos are still used during winter travel. In the western Arctic, where driftwood logs were available, permanent dwellings were constructed for winter use. Windows in this case were made from translucent animal skin parchment. Inuit skilfully manufactured footwear and clothing from animal skins. Even though parkas, gloves and boots followed a similar basic design, regional variations in pattern and technique persisted. Most Inuit made sealskin footwear for both winter and spring or summer use; the latter were entirely waterproof. In some areas, caribou skin replaced sealskin, especially for winter boots. The parka traditionally consisted of an inner and outer jacket, usually of caribou fur. Some groups wore sealskin parkas and pants in the spring and summer, and caribou fur in winter. Women’s clothing was often more elaborate than men’s, with a voluminous hood on the tailed and aproned parka. Women carried infants in a pouch against the woman’s back, not in the hood. To adorn their bodies, women generally practiced facial and arm tattooing. Men sometimes had tattoos on their faces and bodies. Women also generally wore headbands made of copper or bone, while some men had facial piercings. Both men and women were known to have pierced ears and noses. 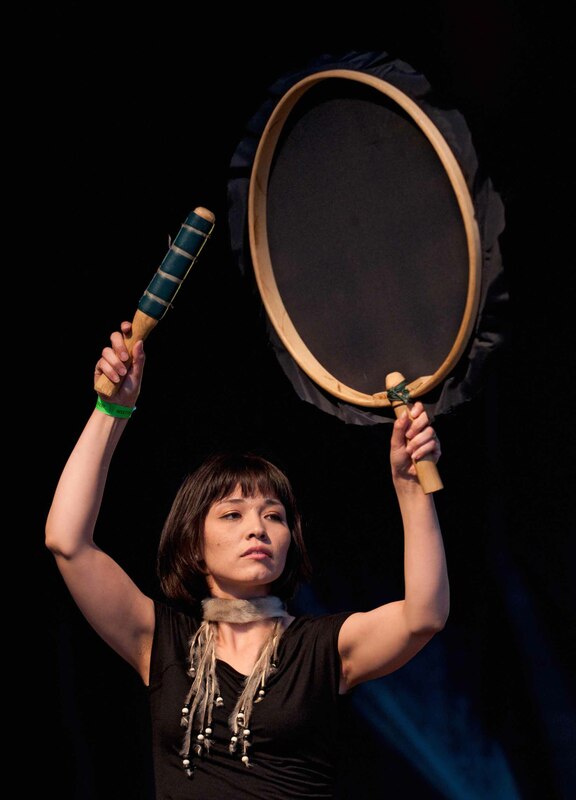 Charlotte Qamaniq-Mason of the group Tumavut, plays a traditional Inuit drum in a performance at Westfest in Ottawa (10 June 2011). As in many Indigenous cultures, the drum is a sacred cultural item among the Inuit. Made by stretching an animal-skin membrane across a wooden hoop, drums served as traditional musical instruments. Among Western Arctic Inuit, several sitting drummers usually accompanied one or several dancers; whereas in the Central and Eastern Arctic, the drummer would not sing. Following contact with outsiders, instruments such as concertinas, accordions, fiddles, harmonicas, jaw harps and, more recently, guitars became widespread. Square dancing, often in extended and intricate performances, sometimes without a caller, has remained very popular. Inuit vocal games, also known as throat singing, occurred among some groups, usually performed by two women producing a wide range of sounds from deep in the throat and chest. This art is still practised in the Arctic. Artisans made decorative art by sewing skins or inscribing on utensils. Recent innovations in Inuit art, such as soapstone carving, printmaking and wall hangings, stem from traditional skills, sometimes using new materials or techniques. In terms of sport and recreation, many Inuit compete in physical challenges that test one’s ability to high-kick (one and two foot varieties), kneel-jump, and perform many other feats of strength and dexterity. Many of these games are featured in the Arctic Winter Games, held every two years in a new location across the Arctic, including Alaska and Greenland. The Games attract competitors from Inuit Nunangat, as well as from other arctic regions. Since contact with outsiders, Inuit society and culture has undergone change. The early adoption of iron tools, firearms, cloth, and wooden boats altered or replaced certain material items. 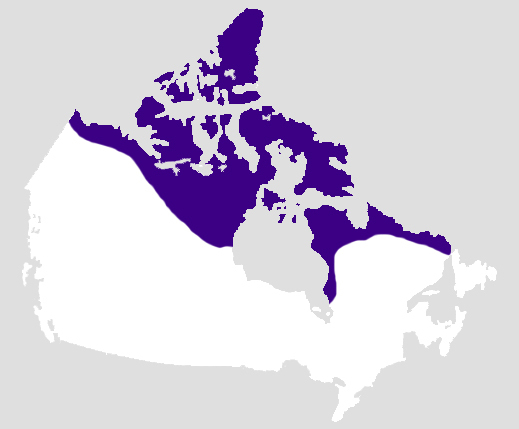 The spread of Christianity resulted in the loss of many traditional religious ideas and practices, and Canadian law has been superimposed on customary law in areas concerned with marriage, dispute settlement and wildlife management. (See Indigenous Law.) Even the language has changed; written Inuktitut, for example, uses Arabic letters — the same letters as English and French — as well as syllabics. Many items traditionally used by Inuit remain in use by all peoples in the Arctic; among these are harpoons used in marine mammal hunting, sealskin boots and caribou parkas required for winter hunting, and sleds used in winter travelling. Techniques of preparing animal skins and sewing skin clothing have also been preserved. Early missionary activity was similarly constituted, with many new rules and prohibitions introduced and penitence demanded after sinning. In the 20th century, the intensive efforts of missionaries led many Inuit to adopt Christianity; ordained Inuit clergy or catechists serve many communities. Inuit mythology, a system based on oral traditions and used to explain and instruct daily life, has experienced resurgence as a vehicle for cultural vitality. Programs exist to support the oral traditions and encourage interaction with traditional stories through youth and elders. Young Inuit are expected to learn by example, through close association with adults. Many of the values and beliefs of the society are demonstrated implicitly in behaviour. For instance, the constant sharing of food and other commodities exemplifies the value of generosity and co-operation, and discourages stinginess, greediness and selfishness. Stories that elders like to tell, especially to children, reinforce these important lessons. Inuit in Canada traditionally speak Inuktitut, of which there are many different dialects. (See Indigenous Languages in Canada.) However, because of improved travel opportunities and the development of Inuit-language radio and TV programming, language differences are diminishing. (See Communications in the North and Indigenous People: Communications.) Traditionally, there was no written language, but after contact with missionaries, the Inuit widely adopted writing systems. In the 2011 census, 34,110 people reported Inuktitut as their mother tongue, with 63.1 per cent of these residing in Nunavut and 32.3 per cent in Québec. 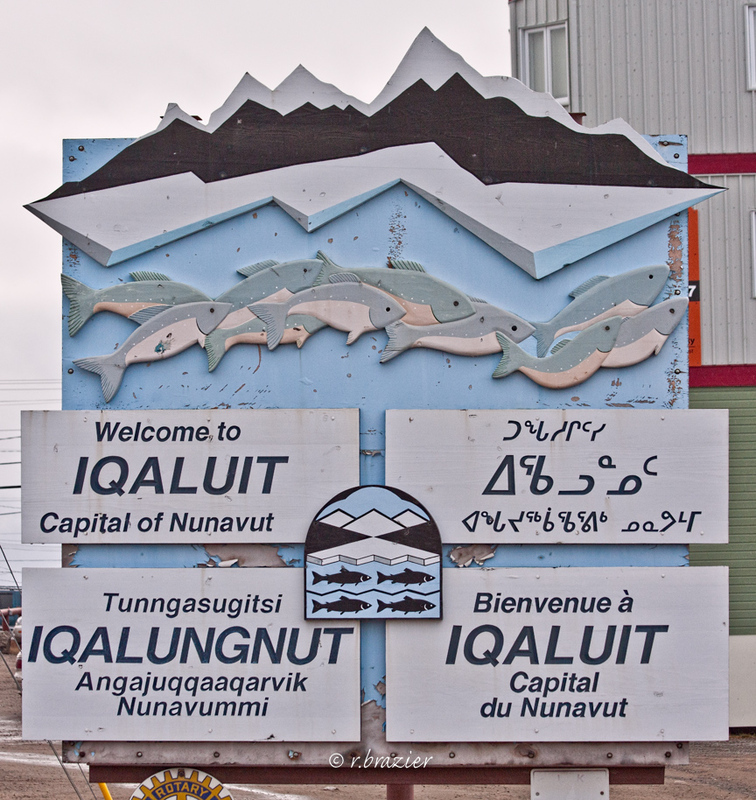 In the majority of communities in both Québec and Eastern Nunavut, over 90 per cent of the population reported having Inuktitut as a first language. One exception is Iqaluit, which reported only 46.6 per cent. Percentages were significantly lower in Labrador; for example, Nain reported 36 per cent and Rigolet had only 5 per cent. At a few other locations in the Arctic, the Inuit and Europeans established fleeting trade contacts, but most contact occurred nearly a century later. 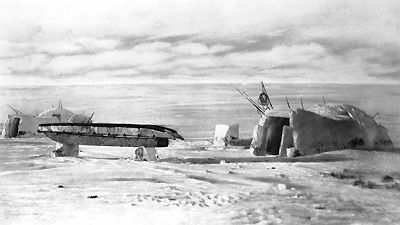 During the latter half of the 19th century, explorers and commercial whalers introduced various trade items to the Inuit, though it was only following the end of commercial whaling, effectively after 1910, that trading posts became more or less permanently established in the arctic regions. Inuit were largely ignored by the federal government until 1939, when they were deemed the government’s responsibility. During the Second World War, Inuit were given disk numbers in lieu of names, for ease of government administration. (See Project Surname.) After the war, there was an intensification of government activity, including the establishment of schools, nursing stations, airports and communication installations, and housing programs in the newly established settlements and hamlets. These impositions caused much cultural tension, as many Inuit were forcibly relocated to areas with which they were unfamiliar. In the early 1970s, a national organization, the Inuit Tapirisat of Canada (now known as Inuit Tapiriit Kanatami), was established to protect Inuit cultural and individual rights. The organization created several agencies in response to expressed needs. An Inuit Language Commission, for example, was formed to seek the best means of ensuring the increased use of Inuktitut for governmental, educational and communications purposes, and a Land Claims Office was established to research and negotiate Inuit land claims. Many of these issues, such as protection of the arctic environment, are international in scope. Therefore, an international Inuit organization, the Inuit Circumpolar Council, was formed with committees seeking to strengthen pan-Inuit communication, cultural and artistic activities, and international co-operation in environmental protection. This organization has affiliation with numerous international bodies, including the United Nations, thereby ensuring that Inuit concerns become widely understood throughout the world. Despite these challenges, Inuit peoples in Canada have celebrated many achievements in numerous fields, most notably self-government and the creation of Nunavut. The Inuit have also been active in discussions surrounding environmental policy, business and education in the North and the revitalization of Inuit culture and language. Jessica M. Shadian, The Politics of Arctic Sovereignty: Oil, Ice, and Inuit Governance (2014). Sheila Watt-Cloutier, The Right to Be Cold: One Woman's Story of Protecting Her Culture, the Arctic and the Whole Planet (2015). Chelsea Vowel, Indigenous Writes: A Guide to First Nations, Métis & Inuit Issues in Canada (2016). Heather E. McGregor, Inuit Education and Schools in the Eastern Arctic (2010). Betty Kobayashi Issenman, Sinews of Survival: The Living Legacy of Inuit Clothing (1997). INUIT TAPIRIIT KANATAMI The website for the Inuit Tapiriit Kanatami, the national Inuit organization in Canada. Click on “About Inuit” for a history of the Inuit people and their contacts with Europeans. INUIT MYTHS & LEGENDS A collection of traditional stories that are central to Inuit culture. Includes tales about mythological figures such as Ijiraat (shape-shifters), interviews and related teaching resources. From the Qikiqtani Inuit Association. DISCOVER INUIT ART Learn more about the history of Inuit art in Canada. From Indigenous and Northern Affairs Canada. L'art inuit : un mode d'expression à découvrirApprenez-en plus au sujet de l'histoire de l'art inuit au Canada sur le site Web d'Affaires autochtones et du Nord Canada. ANGAKKUIIT (SHAMAN STORIES) A video that features stories of personal connections to shamanism in Inuit culture. From Igloolik Isuma Productions. PAN INUIT TRAILS Check out this interactive atlas that depicts Inuit place names, trails and maps in Canada’s Arctic.